I’m so sorry it is over. I love doing Horrorfest and I am so happy that this year I was able to do all 31 days! Let me apologize for the messy postings, they weren’t as edited and full of images as I would have liked but I was so eager to have 31 posts done for publishing that I didn’t take the time I should have to make sure they were fully ready for publishing. So let’s see I promised you horror, suspense, mystery, film noir, monsters, ghosts, Alfred Hitchcock, Lifetime movies, aliens, witchcraft, murder, and cyborgs. And what did I deliver? So lets start off with our yearly films. We always have Alfred Hitchcock, this year with me finally reviewing The Birds and a nod to Psycho with a Boy Meets World episode. Our Tim Burton film with Edward Scissorhands; a double dose of Disney with Maleficent and The Great Mouse Detective; an animated film with The Great Mouse Detective; yearly Stephen King film with The Tommyknockers; and a double dose of Vincent Price with Edward Scissorhands and The Great Mouse Detectives. Our Lifetime movie in The Stranger Beside Me. I watched a ton of them but only reviewed one-probably because this one struck close to home. I also for the first time, reviewed a video game It Lives in the Woods for Horrorfest. I’m thinking about doing it again next year. Lots of psychopaths: multiple family members in American Gothic; the husband in Double Jeopardy; the dad in The Good Student; Griffin in The Invisible Man; the car jackers in Nocturnal Animals; the criminals in Rawhide; and the husband in The Stranger Beside Me. We had quite a few literary nods-Sherlock Holmes with Basil of Baker Street, Agatha Christie’s Crooked House, H.G. Wells’ The Invisible Man, Carolyn Keene’s Nancy Drew, and Phillip Pullman’s Ruby in the Smoke. Had our Jane Austen fix with the final review of Death Comes to Pemberley. Now I guess I’ll have to review Pride & Prejudice & Zombies in order to keep Jane Austen in Horrorfest. Classic monsters with Dr. Jekyll in Sccoby-Doo, Dr. Jekyll in Dr. Jekyll Versus the Werewolf, and the Invisible Man in his first film appearance. So every year we review a Vincent Price film. Here we go! Yes I said that right, Vincent Price. Many of you may not know this, but this was Vincent Price’s last film. When I first saw this, I actually knew about Vincent Price than Johnny Depp. In fact Vincent Price was supposed to have more screentime, but unfortunately was very ill at and they had to cut back on those scenes. Sad for us. This also fills another yearly notch, a Tim Burton film. So let’s not wait any longer. On with the review. So the film starts off with a grandma, Kim Boggs (Winona Ryder) telling her granddaughter a story-of a man with scissors for hands. Flashback years ago-Peg Boggs is the Avon lady, along with being kindest and sweetest woman ever. She tries to sell in her Suburban neighborhood but none are interested. She’s finally reached the end of her rope-but then spots the creepy, spooky castle that exists at the end of the block. She decides to go in there and that is when everything changes. Inside the worn and crumbling mansion-which she enters by herself! Very unsafe-and meets Edward. Edward was created by the Inventor, but is unfinished-he still has scissors for hands. Peg feels bad for him and takes him home with her-he meets her husband Bill (Alan Arkin), who is completely checked out and doesn’t see or hear anything, and son Kevin. Kevin is fascinated by Edward and wants to show him off. As many times as I have watched this I am just amazed with the character of Peg. She reminds me of the mom in My Boyfriend’s Back, but sweeter, kinder, and not nearly as psychotic. She is always encouraging and helping Edward. Peg Boggs: Are you alone? Do you live up here all by yourself? What happened to your face? No, I won’t hurt you. But at the very least, let me give you a good astringent. And this will help to prevent infection. What’s your name? Peg Boggs: Edward… I think you should just come home with me. And if anyone tries to say anything about him, she will go mama bear on them. Audience Member #3: But if you had regular hands you’d be like everyone else. Host-TV: I think he’d like that. Audience Member #4: Then no one would think you’re special. You wouldn’t be on TV or anything. Peg Boggs: No matter what, Edward will always be special. So Pegg let’s Edward stay in her daughter’s room while she is camping with friends on her waterbed. Really Peg, he has scissors for hands! Anyways, the neighbors are fascinated and want to take a look at him, forcing themselves on them with a BBQ. Edward starts trying to get used to living with people. If you carefully watch Edward in the beginning he is moving his hands all over-but as he watches the others and as the movie progresses learns to better control his hands and be more humanlike. And I do have to say I like the costume of Edward. I like Buster Keaton look carrying over from Benny & Joon and his Cure/Tim Burton-inspired hair. It wouldn’t always work, but it does on him. So Edward is a hit, especially after he starts creating colorful topiaries. Kim returns home from her trip in the mountains with her boyfriend Jim (Anthony Michael Hall). The first time I saw this-I didn’t recognize him. I don’t what he did but he went from major nerd in the ’80s to playing football jocks in the ’90s. I always think if him as being one of the lucky three who were able to go from “nerd” to “heartthrob”-him, John Cusack, and Patrick Dempsey. Kim returns home after “camping” and goes to her room-only to find Edward. Proof why scissors and waterbeds don’t work out. From lawns Edward goes into animal haircuts. And here he becomes an even bigger sensation. But not everyone loves him. Poor Edward-hopefully in love with Kim and he really is. At this time Depp and Ryder starting dating and even got engaged-and you can just see in his eyes how much he cares for her. In fact, re-watching it this time I realize they spend hardly any screentime together, but can carry the romance in their looks, body language, tone, etc. Anyways, Edward keeps trying. Kevin takes him to school for show-and-tell, he is always there to lend a blade, and then begins haircuts. In fact the scene when he first cuts hair is a wink at Sweeney Todd, which Tim Burton and Johnny Depp would make years later. The sweetest thing is when Edward is going to cut Peg’s hair-he makes it extra special and neat for her-his mom. Aw. 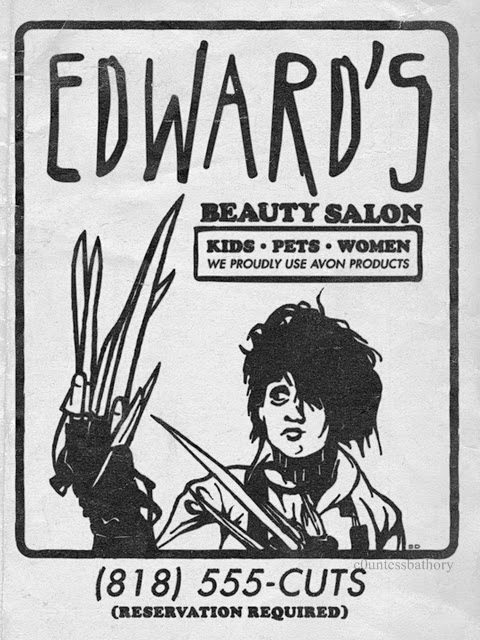 With all this Edward goes on TV and the idea of opening his own business is brought up. Neighbor Joyce is going to help and takes him to the area where they will be having the salon. She then strips and assaults him. Edward flees and Joyce is very upset. Peg is going to help Edward and takes him to the bank-but here is where I realize I am an adult. I mean I know I am one, after all I’m six and twenty-but here is where I KNOW. My first response was how will he get a loan? He has no social security card, birth certificate, anything. Poor Edward is sad and they are unsure what to do next. Now let me take a moment here and just go over Vincent Price’s role in the film. Throughout the movie we have flashbacks to when Edward was first created. The Inventor (Vincent Price) has an assembly line making cookies. As he enjoys them he gets the idea to make his son-Edward. I love these scenes as they are so endearing and said. What would have been if the creator lived. 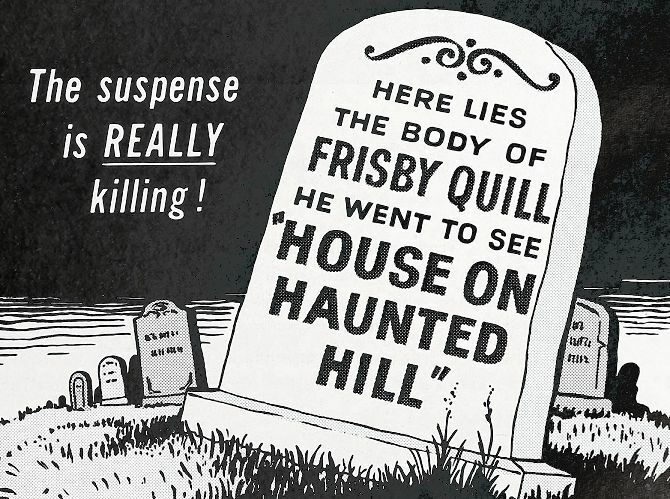 I love Vincent Price’s voice as well. I could just listen to him speak for hours. One day Kim forgets her key and they are locked out of the house. Edward opens the door by picking the lock and Jim gets the idea to use Edward to rob his house. You see JIm is a Neanderthal that instead of getting a job to get his own car wants his dad to do it. And if dad refuses-well then the only way is to rob his house. What a baby-WAH BOO HOO I can’t get my way let’s make dad pay for it. They lie to Edward that a guy stole Jim’s stuff and want to get it back. Kim feels bad and wants to stop, but they don’t listen to her. Instead-they go but when the alarm goes off abandon him. Kim is angry wanting to go back, but they don’t listen to her and she doesn’t do anything. Now I like Kim, but she never tells the truth. It makes me so angry-all this awful things keep happening to Edward afterwards and they could have stopped it if she had just told the truth. Very disappointed in you Kim. So Edward is taken to jail and held until Peg and Bill can pick him up. After that he is a pariah. No one wants to be around him, have him cut their lawn, dog, or hair. Kim gets angry with Jim, but he just taunts her with how she hasn’t said anything. Edward sees this and becomes even more angry as he did it for Kim and she is still with the jerk. He gets depressed and ruins his creations-he also gets angsty and messes up the walls. Peg is awesome-she continues to be there for Edward. She has him keep giving her haircuts to make him feel better. Se sweet. All comes to a head on Christmas. Edward and Kim have grown closer. He works on an ice sculpture and accidentally nicks Kim. Jim comes and chases Edward off who goes on a rage destroying shrubbery. Kim is done with Jim and he storms off drinking with his friend. Kim’s hand is taken care of by her mom and it wasn’t a serious wound just a small one. They worry about Edward and go off to find him leaving Kim to wait in case he comes back or the neighbors come for the party. Edward returns and they have a good moment, broken when a drunken Jim comes racing down the street and almost hits Kevin. Edward runs and pushes Kevin out of the way before he gets killed. But by doing so nicks Kevin, especially as Kevin doesn’t know what is going on. Jim comes and tries to attack Edward, who nicks him too. Edward then storms off-followed by Kim. Meanwhile like in every monster movie the neighborhood storms together creating a mob to converge on Edward. In the mansion Kim approaches Edward, ecstatic that he is alive, but just like in Beauty and the Beast, Jim the jerk followed them and tries to kill Edward. He was going to shoot him-but Kim intercedes. Edward had not planned on doing anything-but when Jim slaps Kim he becomes angry and stabs Jim-throwing him out the window. Kim and Edward see the dead body and know the mob won’t stop until Edward is dead. Kim kisses Edward and says good-bye. Downstairs, the people are calling for Edward’s blood. Kim notices a machine and grabs a scissorhand-using it as proof that Edward is dead. She tells them it is all over. This scene definitely has a Nightmare on Elm Street feel to it with the scissors-which Johnny Depp is also in. That ends it and all goes back to how it should be-except the Boggs family. Years pass and they all move on-but Kim always remembers Edward. And Edward never forgets her. His garden growing and he’s making an ice sculpture of Kim to grace his garden. Such a great story with a gentle sweet character. I love this film and could just continue to watch it over and over again. And this little extra for you guys! So I’ve been meaning to review this film for Horrorfest since October 2012, but just haven’t gotten around to it. How funny that it’s first appearance was Christmas and second Valentine’s Day. Edward Scissorhands (Johnny Depp) was created by the Inventor (Vincent Price) who lives in a castle at the end of suburbia. Before he could complete Edward and give him hands, he passed away. Edward has been living alone until he is found by Avon Lady, Peg Boggs. She decides to take him home to her house to take care of him: introducing him to her husband, son Kevin, and daughter Kim (Winona Ryder). Having lived home alone he doesn’t have a lot of social skills or understand things such as sarcasm. They throw a big party for the neighborhood to meet him and all like him, especially as they see his lawn trimming capabilities. He then grows from lawn work to dog grooming to hair styling. The only one who doesn’t care for Edward is Jim, Kim’s boyfriend. Jim wants money to buy a van for him and Kim, but his father won’t give him any more. Jim comes up with a plan to break into his father’s house, using Edward to get in. They do and the alarm goes off. Everyone runs away and Edward takes the blame. After that everyone shuns Edward. Everything comes to a head one Christmas. In the end will Edward be able to find love, his place, and create more art? So Edward gets caught in the burglary, Jim having done it on purpose, and everyone hates him and speaks badly about him. Kim talks to him, sorry for what occurred and sorry she didn’t do anything to assist him. She is also sorry for who the house belongs to. But Edward reveals he knew that all along. Here is a guy that understands very little of how people talk and the secret meanings we might have underneath things; such as sarcasm, often thought of like a kid. But he knew what was going on, and even though he knew, he did it anyway. He would have done anything that Kim asked him to do, because he loves her. Kim: It must have been awful when they told you whose house it was. Kim: …Well, then why’d you do it? And another thing Mr. Chick Young! The next time I tell you that I saw something when I saw it, you believe me that I saw it! I had never seen this movie before and decided to rent it after looking over my Wolf Man (1941) review. I thought it was hilarious! So this film was done during a time of a series of monster films, along with Abbott and Costello films. I’m not sure who came up with the “meeting” idea, but it was a fantastic one. It’s funny, the other day I was watching the Nostalgia Critic‘s review of Freddy Vs. Jason, and he cited that that film created the Versus series we see today. I would have to disagree with him and say this is probably the first “versus” film, with Dracula versus the Wolf Man. It was a great comedy, horror film, parody, a multi-genre crossover. Chick Young: People pay McDougal cash to come in here and get scared. Wilbur Grey: I’m cheatin’ him. I’m gettin’ scared for nothin’. And you have both Bela Lugosi reprising his role as Dracula and Lon Chaney Jr. reprising the Wolf Man. The only thing I don’t like is the title. I mean they meet Frankenstein’s monster but he is hardly even in the film. It really should be Abbott and Costello Meet Dracula or Abbott and Costello Meet the Wolf Man as both of those characters play a much larger role. So the film starts off with Wilbur Gray (Lou Costello) and Chick Young (Bud Abbott) working as package delivery men. Wilbur is currently dating a beautiful woman, Sondra and has plans the next night to go to a masquerade ball. Too bad they didn’t put the Phantom in here too. Later that day he gets a call from Lawrence Talbot (Lon Chaney Jr.), AKA the Wolf Man, warning him not to deliver packages to Dr McDougol’s House of Horrors. But the full moon comes out, turning him into a werewolf and Wilbur doesn’t get the full message. and Frankenstein’s monster (Glenn Strange). They are freed; both taking off as Dracula wants to give the monster a new brain, a dumber one, to control it better. He has enlisted the help of Dr. Sondra Mornay, the same Sondra who is dating Wilbur. Yes, it turns out she is only with him as his brain is the one she wants to use in the operation. Meanwhile, Wilbur and Chick have been put in jail as McDougal holds them responsible for the missing exhibits, believing they stole them. They are bailed out by Joan Raymond, private investigator, who doesn’t believe they are responsible. She has also fallen in love with Wilbur. So now Wilbur has two beautiful girls after him, Frankenstein’s monster, Dracula trying to get his brain, and the Wolf Man trying to get his help/also attack them when Lawrence turns into the beast. It is hilarious fun and there is a great scene at the ends when Dracula and the Wolf Man duke it out. And don’t forget to keep your ears peeled for a Vincent Price cameo!